Sorrily botched the project may now be, but it’s worth it to get Morrissey out of our Inbox. Yes, I can be intensely persistent, and I certainly have an over-active fantasy-life, but the Harvest experience tells us that despite the blinding flash of teeth and smiles, it doesn’t take much for the coin to flip and suddenly we’re all compromised and shattered. All you need to do is disagree with the vanity of the label boss and your beheading will be slotted in between bottles of the most average champagne on the market. Just one weak-chinned drone can assert the fist of injustice and all of our efforts are flushed away. He then predicts that World Peace Is None Of Your Business will “instantly disappear from iTunes and record stores and every download-upload-offload outlet on the planet.” Indeed, today it is no longer available on iTunes, Rhapsody, or any streaming or download service, though physical copies are still available. 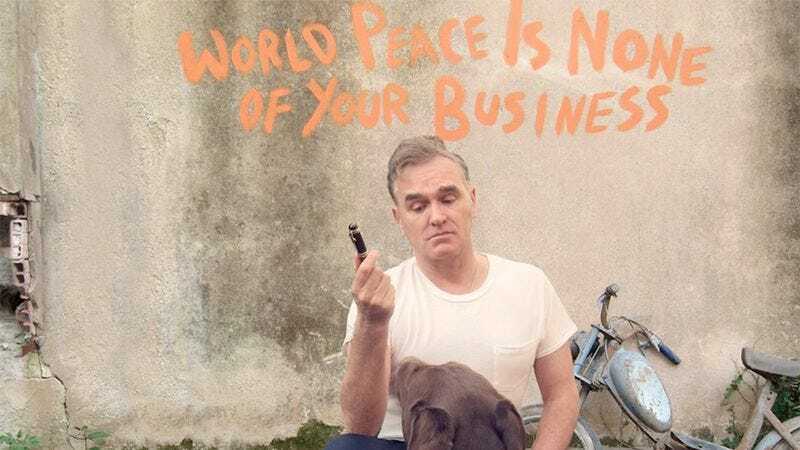 Morrissey says he’s now looking for a new label, though why he actually needs a label—or why a label would want to work with him, lest said label find itself blamed when the just-okay record under-performs—is another story all together.